Few days back we covered a mobile TV application for Symbian mobile devices . It was used to access some predefined mobile TV streams played trough internet . Here is another similar application which can access live internet radio streams on Symbian ,Palm, Windows mobile and Blackberry phones . Mundu ,this free mobile internet radio software can play thousands of internet radio stations in almost all mobile phone platforms . 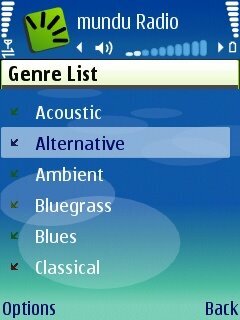 I tested numerous mobile internet radio applications including Nokia internet radio . But all of them are limited to some mobile platforms or they don’t have enough number of radio stations . If you have a faster and unlimited mobile internet plan , I strongly recommend you to have Mundu mobile internet radio in your phone .Slow GPRS users can also use mundu internet radio , but will sometimes gives an interrupted playback for some radio stations . Register here before start using Mundu mobile internet radio. You can mange your radio stations play lists in Mundu online account . Radio playback depends upon the availability , quality and speed of the internet connection . You can select the radio stations according to your type of internet connection . Digital MP3 radio stations are also available ,but you need a mobile internet connection upto 128 kbps Mundu is an Indian company , so we can enjoy Indian internet radio stations like never before. Download mobile radio Windows mobile . Download Mundu mobile internet radio streaming software for Blackberry . Download Mundu mobile internet radio Palm . Great Article. Did you know that Mundu Radio now on BlackBerry devices! I just found out after searching for it online. Thanks a lot. I have a Blackberry Curve!